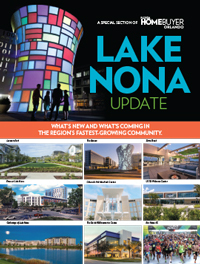 Your comprehensive guide to new homes and communities. Welcome to the interactive companion to Florida Homebuyer Magazines and Map Guides. 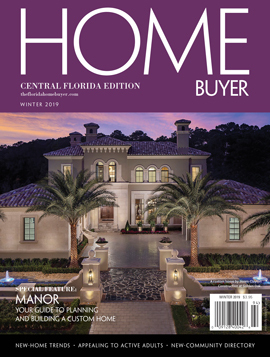 Florida Home Media LLC publishes two regional print magazines, in Orlando and Sarasota, and an array of print Map Guides spotlighting those communities as well as Jacksonville and Tampa. This website offers much of the content you&apos;ll find in our print products as well as the largest, most comprehensive searchable new-home database in Northeast, Central and Southwest Florida. That&apos;s a lot of resources to help you find the perfect new home for you and your family. Central Florida is the tourism capital of the world, but it is also a family-friendly place with cozy neighborhoods, excellent schools and an emerging high-tech employment base. Lakes and parks abound and there are an array of cultural venues to enjoy. Orlando also boasts the state's newest medical school as well as a medical research complex. Sports fans cheer for the Orlando Magic. 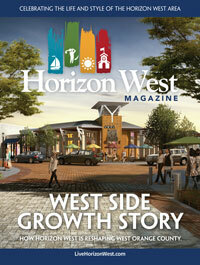 Horizon West Magazine celebrates the life and style of the Horizon West area. With 52 communities and more coming, the boom is underway. Discover the next chapter of Central Florida's history. The neighborhoods and biomedical facilities of the region's hottest development are an incubator for extraordinary innovation. Central Florida is the tourism capital of the world, but it is also a family-friendly place with cozy neighborhoods, excellent schools and an emerging high-tech employment base. Lakes and parks abound and there are an array of cultural venues to enjoy. Orlando also boasts the states newest medical school as well as a burgeoning medical research complex. Sports fans cheer for the Orlando Magic. Why has low-key Jacksonville emerged as perhaps Florida’s most desirable relocation destination? Well, there are its pristine beaches, its access to the St. Johns River and Intracoastal Waterway, its lively arts and sports scenes, its sweet southern charm and its surprisingly affordable homes. And that’s just for starters. One of the most dynamic and fast-growing metro areas in the country has all the lifestyle attributes relocators are looking for. But if sun, surf and sports attract people to the region, plenty of other cultural and recreational opportunities—as well as strong job growth and a thriving economy—keep them here. One of the most military-friendly regions in the country is the Tampa Bay area on Florida’s Gulf Coast. It’s home to MacDill Air Force Base, the headquarters of the U.S. Central Command (CENTCOM), the largest Coast Guard Air Station in the nation, Air Station Clearwater and the James A. Haley Veterans Hospital. Canadians clearly love Florida. More than 1 in 10 Canadians visit Florida every year, and some 500,000 Canadians own property in the Sunshine State. Not surprisingly, Central Florida — which includes the Orlando area and its international attractions — sits near the top of the list for Canadian homebuyers.